For an increasing number of people, daily experience has become an aggregation of linked passages through old, familiar and new networks. I borrow the specific usage of the word “new” from Christiane Paul’s distinction of the word in her introduction to her book Digital Art. For Paul, the “new” in the term “new media art” “points to the fleeting nature of the terminology.” She dutifully and concisely treks through her introduction, documenting key moments in the development of the computer by providing historical evidence for why our networks and personal computers look and act the way that they do. And as her brief timeline asserts, new doesn’t last very long. Developments in technology have been and continue to be so fast and dramatic that there is very little time to situate oneself in the current moment before one is shocked into a new realm opened by the latest technology. To demonstrate this phenomenon, Paul mentions the 1945 Vannevar Bush article As We May Think, which introduced the prescient concept of the memex, an academic tool with functions much like the modern computer. Only a month after this article was published, the world was introduced to nuclear weaponry and two major cities in Japan were decimated. The evolution of computer technologies then sprinted to a newly envisioned (cyber) space that could survive nuclear fallout. The beginnings of the Internet, funded through the United States’ Advanced Research Projects Agency and the RAND Corporation, responded to nuclear proliferation and cold war anxieties by creating a communication system that was designed to withstand a nuclear war. 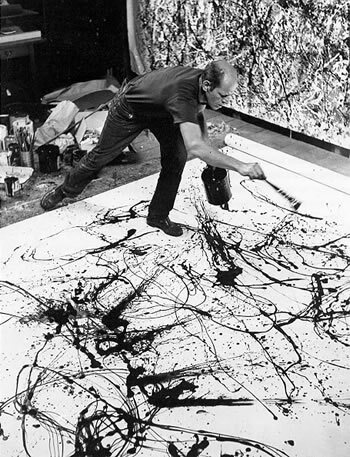 At the time, Abstract Expressionism was dominating the art world, refusing traditional compositions and at times even the canvas such as Jackson Pollock’s canvases that lay on the floor as he splattered paint on them in a rhythm like jazz rather than formal composition. The connections between the growth of what would later be popularly known as the Internet and abstraction in the arts seem based in networks. In an abstract painting, networks form between colors, patterns and irregularities. Sixty years later, the Internet is much more widely available and oftentimes required for business, school and personal life. One category of art that has sprung up from this availability is “new media art.” Newness is something constant in new media art, and thus as an epoch in art history, new media art will be a chimera forever onwards. There will be thematic considerations for certain, but as a general movement, there will be no end to the “new” media that will be introduced. In qualifying the usage of the word “new” in her introduction, Christiane Paul makes clear that “new media art” is by definition a genre that will never have a fixed landscape and therefore does not have a unifying aesthetic. I disagree. Never before have artists used a singular medium with such collectivity as with the Internet. By singular, I mean that this particular medium has a distinct history in its creation and all derivative technologies and networks that one uses has an origin story directly related to the U.S. military. I do not think it is inaccurate then to suggest that because of this history, the aesthetic of digital media art is one marked with apocalypse. This suggestion may seem dire and perhaps a bit spectacular, but consider the history of the idea of the Internet. Vannevar Bush saw the potential of the Manhattan Project and introduced an idea of the memex that became the foundation for what is now the personal computer. ARPA and the RAND Corporation devised a network for that computer to communicate with other computers in the event of nuclear war. Government subsidies funded computer science programs at MIT, Stanford and Carnegie Mellon and students from these programs would develop graphic interfaces, operating systems and software. Artists currently use much of this software and equipment. Perhaps the apocalyptic tinge is imperceptible to some, and certainly many people are not aware of the origin story of the Internet. Yet, I think it’s present in the very medium of digital technology. The use of these technologies marks a collapse of classical notions of progress, which in itself is a form of apocalypse. Time as we knew it has been erased and reconstructed at incredible speed. The apocalyptical aesthetic is present in every anxiety about digital technology, cyborgs, mutation and genome sequencing that is acknowledged in art and society. Apocalypse in digital media is synonymous with newness because apocalypse has now become possible outside of holy intervention – it is possible because we have the technology and thus, it is a new realm of responsibility, awareness and new codes of war. Digital media holds the potential for the awesome, the incredible and the new because of this threat of death. It is imbedded in the media itself and qualifies the unique landscape of digital media as one of a deadly origin story that presents unspoken ethical dilemmas for artists and audiences alike. Is Wikipedia Decaying or Growing Up?